Imagine a Siberian gulag, but only if you dare. News of Joseph Stalin’s death has reached the camps despite the continuous import of new prisoners. The plan, albeit risky, is to charge the prisoners as slaves. When the liberating Americans come, the guards will master the prison into a bustling town, with a school, and shops, and homes. As soon as the Americans turn to vacate the icy landscape, the fences go back up and citizens are once again slaves. Alek Karriker is betrayed by the tattoos covering his body, marking him as not a guard of the military, but a traitor to his people, siding with those that keep watch over the prison. Such a position becomes increasingly precarious, when the prisoners begin to strike back. They start killing off their captors one traitor at a time, thus making it a matter of coincidence or inconvenience, before Alek finds himself in the wrong place at the wrong time. His only option is to escape the prison with his friends into the barren wasteland that isolates them. J. David Osborne comes at you with his debut. In between rounds he stares you down from his corner of the ring, rinsing with vodka, muscles tense for the bell to ring again. By the Time We Leave Here, We’ll Be Friends is comprised of short bursts of chapters, each one finding its mark. The swift blasts dazzle you with settings so real, so vibrantly depicted you feel the cold deep inside you. Dialogue turns the story, while action twists its direction. Had this novel been a video game, Osborne’s combos would elicit such a blinding display of earned bonuses, epileptics would be banned from being anywhere near this book. Osborne’s promised us a second novel, and soon. After such a strong debut, threats of a rematch leave the reader face-down, praying for mercy. The ending of By the Time We Leave Here, We’ll Be Friends grounds and pounds you. Puddles of drool threaten to sweep your dazed body away, leaving you to wake, screaming. Another book is on its way to destroy you and you’ve willingly burned away any knowledge of a safe word, how to wave a white flag, or whatever boxers do when they quit. Throw in the towel, that’s it. You’ll pretend to not even know what a towel is, begging for the pain to be brought. 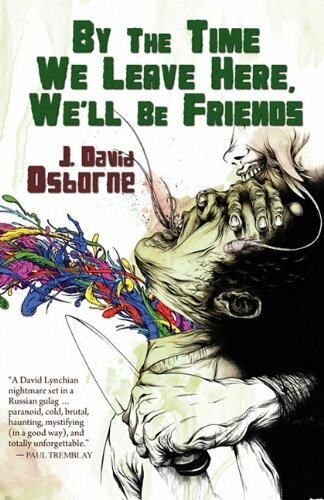 This entry was posted in Reviews and tagged Alex Pardee, By The Time We Leave Here We'll Be Friends, J David Osborne, Jeremy Robert Johnson, Swallowdown Press. Bookmark the permalink.